In Return to Order, there is special mention of what is called “a Way of the Cross society.” This concept affirms that when men carry the crosses and sufferings that come their way, this leads to a society that is balanced, ordered and rich in culture. Below are ten maxims for carrying life’s crosses. 1. The character of a person is determined by how well one knows how to carry one’s Cross. 2. Understand your cross and that of others. 3. Love the cross you have and admire all the ones you don’t have. 4. Have always before you that part of your cross you do not have the courage to face. 5. Understand the two sides of the Cross: the sufferings and consolations. 6. Suffering is not mathematical and does not apply to all equally. 7. God allows us to fall sick but also prepares the bed. 8. Look at suffering frontally; expect unexpected help. 9. Accept the sufferings but also the joys that come your way. 10. The Way of the Cross is a way of resignation to suffering with light. 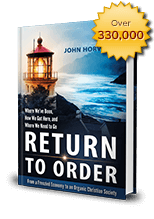 This entry was posted in Featured and tagged beautiful, book signing, brutal pace of life, Catholic Church, Christian civilization, frenetic intemperance, marvelous, moral values, Natural Law, Nobility of purpose, Return to Order, tradition by John Horvat II. Bookmark the permalink.